We're serious about our business success and serious about helping businesses and sales people to make new connections. At Business Owners & Reps we share tips on marketing and sales and encourage members to mingle and share their struggles and triumphs in businesses. - A game of Business Card Bingo to help promote your business - make sure you bring plenty of business cards! - A Speed Networking experience to help you promote yourself to your fellow members! We want to make this catch up enjoyable and valuable for everyone, so if you’re keen to promote your business, build your networks, and have some fun, then come along. 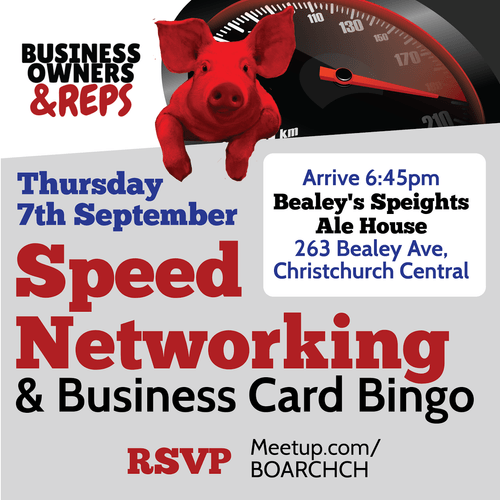 This Business Owners & Reps event will be held at the Bealey Avenue Speights Ale House (263 Bealey Ave, Christchurch Central) on Thursday 7th September, from 6:45pm. Parking is available in the parking lot, as well as on Bealey Avenue. Please arrive no later than 6.45pm, and bring along a pen. If there is someone you think who would get value from meeting new people and increasing their network then feel free to invite them. Business Owners & Reps Team.